Each wine bottle cork art piece is a collage of memories. Each cork has a story to tell whether it's from a toast, celebration or special meal. 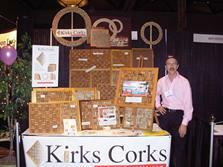 Each piece is make from matching corks sorted from thousands. Perfect quality, soaked in oils.....these are all matching in size. The frames are then built for the 2 most common lengths for corks, which always fit perfect in their sized frames. Like a puzzle they are fit in tight, then removed, then glued back in for a symetrical piece. Then the frame is pressed for 3 days while the glue dries.